Bishop Nicholas DiMarzio ordained five men to the priesthood for the Diocese of Brooklyn at the Co-Cathedral of St. Joseph, Prospect Heights, Saturday, June 30. The average age of the ordinands is 34 years. Two were born in Queens to immigrant parents, one set from the Dominican Republic and the other from Ecuador. The other men were born in Vietnam, Haiti and Germany. Their stories are as diverse as their backgrounds. One is a cancer survivor, who only felt truly healed after entering the seminary. Another holds master’s degrees in computer science and business administration. Two come from agricultural families. One speaks four languages. They count among their saintly role models St. Pope John Paul II, St. Paul, Padre Pio, St. Therese of Lisieux, St. Francis of Assisi and St. Clare. Their interests include traveling and pilgrimages, reading, music, dancing and sports, especially baseball and basketball. Five priests were ordained by Bishop Nicholas DiMarzio on Saturday, June 30, at St. Joseph Co-Cathedral, Prospect Heights. 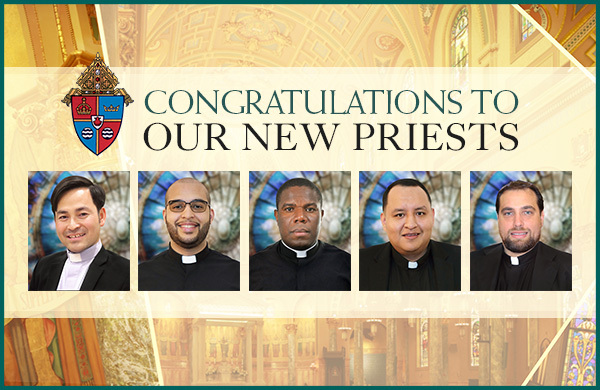 Four were ordained to serve the Diocese of Brooklyn and Queens while a fifth will minister here temporarily as he awaits return to his home diocese in Vietnam. Photos from the 2018 Ordinations of five new priests of the Diocese of Brooklyn. If we were to place one currently active Hispanic priest in every parish with Hispanic ministry, about 1,768 parish communities would not get that privilege. Father Patrick Dorelus, 41, was born to a devout Catholic family in Haiti. Hmong-American Catholics came in large numbers to the Cathedral of St. Paul May 26 dressed in native attire to celebrate the first U.S.-born Hmong-American to be ordained a priest. The invitation to discipleship for Father Jose Diaz, 28, came in the form of a letter from a concerned friend during high school.